The Ableware Double-Sided Quilted Walker Tote Bag conveniently hangs over walker crossbar making any ole walker look good! 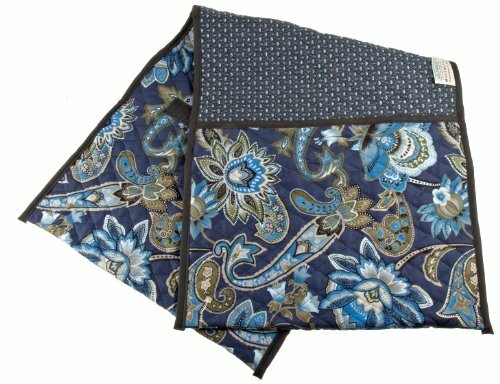 Designer inspired, decorative quilted cotton pattern in blue. Walker bag has roomy pockets in the front and back so you can take your "stuff" wherever you go. Bag conveniently hangs over the walker crossbar and is held in place by hook-and-loop closures. Patterns are subject to change.Tote bag can be machine washed and tumbled dry. Pockets measure 13 x 9 inches and overall bag measures 15.5 x 6.5 x 1.5 inches. The Ableware Double-Sided Walker Tote Bag comes with a one year limited warranty. Maddak specializes in home healthcare and rehabilitation products for the senior, disability and rehab markets. We have been recognized as the largest manufacturer in the United States of Aids for Daily Living (ADL). Maddak continues to design and manufacture products that increase mobility, maximize independence and enable people to live more rewarding, dignified and enriched lives.